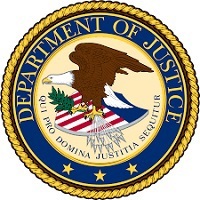 A federal jury in Atlanta has convicted Erick Powell, a former operator and co-owner of the National Vocation Group job-staffing company, of wire fraud. A second defendant and co-owner, Ahmad McCormick, previously pleaded guilty to wire fraud. Powell and McCormick used online job boards to advertise jobs in the housekeeping and maintenance industries that paid above-average wages. NVG falsely told applicants that they must pay a $349 fee for federally required OSHA training before starting work in the advertised jobs. OSHA does not require such training. Hundreds of applicants paid the fee and took the course, but none of the applicants received the jobs they were promised. When several victims complained to law enforcement, NVG relocated its offices and continued its fraudulent activities. Both defendants face up to 20 years in prison. For more information, read the Department of Justice news release. For more information on local training requirements, visit OSHA’s Training webpage. Koch Foods of Gainesville, LLC., was cited for exposing employees to amputation hazards; and failing to provide fall protection, identify which employees were using hazardous energy control locks, and train employees exposed to noise hazards. Proposed penalties total $208,977. OSHA conducted the inspection as part of its Regional Emphasis Program for Poultry Processing Facilities. Read the news release for more information. OSHA cited Goodyear Tire & Rubber Co., for failing to: provide personal protective equipment to employees exposed to burn hazards; implement procedures for controlling hazardous energy during equipment maintenance activities; and caught-in hazards from unguarded machines. Proposed penalties total $69,058. For more information, read the news release. New Lenox, Ill., pallet manufacturer, Supplyside USA, was cited after an employee was injured while performing equipment maintenance. OSHA inspectors determined that the company, which operates as Prime Woodcraft, Inc., failed to install machine guards, implement energy control procedures to prevent unintentional machine operation, train employees on noise hazards, and prevent dust accumulation on surfaces. Proposed penalties total $91,832. Read the news release for more information. OSHA has cited Action Concrete Construction, Inc., for exposing its employees to fall and eye hazards. Following an investigation of the company’s Panama City Beach, Fla., worksite, inspectors identified one willful violation for failing to install guardrails or use personal fall arrest systems while employees worked at a height of 11 feet. A second citation was issued for allowing employees to use a pneumatic air gun without proper eye protection. Proposed penalties total $59,864. For more information, see the news release. The Washington Division of Occupational Safety and Health (DOSH) issued $355,000 in fines to the owner of the Seattle Pacific Hotel for knowingly exposing workers to asbestos hazards during lobby renovations. DOSH inspectors concluded that the hotel owner failed to inform, train, and certify workers on the hazards associated with asbestos removal. Inspectors issued an immediate stop-work order when the hazards were detected, and they determined that the owner also failed to sample the air prior to renovations, remove unmitigated asbestos debris from the site, and provide adequate respiratory protection. For more information, read the news release. Minnesota OSHA issued $75,000 in penalties to Tom Baures Excavating, LLC., in Minnesota City after a worker was fatally crushed by a lowering tow truck box. Inspectors determined that the company failed to adequately train workers, and ensure that safe lockout-tagout procedures were developed and followed while workers were servicing the truck. More than 300 industry members and OSHA personnel participated in a Jan. 17 webinar on how the proper handling and storage of grain prevents engulfment and other potential hazards. 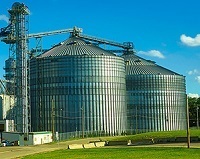 The webinar, sponsored by OSHA and National Grain and Feed Association Alliance in collaboration with the Grain Elevator and Processing Society and American Feed Industry Association, is part of this year’s Stand-Up for Grain Engulfment Prevention Campaign that will continue this spring, with a focus on other events planned April 9-13. Scheduling a safety walk-around. OSHA’s new fact sheet, Safety Walk-Arounds for Managers, provides suggestions for conducting inspections that can help you evaluate the effectiveness of your current safety and health efforts, and communicate directly with workers about job hazards. Attending the Safe + Sound Campaign’s first live, free webinar, Foundations for Safety Leadership, hosted by CPWR: The Center for Construction Research and Training on Wednesday, Feb. 21, at 2 p.m. EST [register now]. This webinar can support your efforts to become an effective safety leader and create a strong culture of safety. James Machine Works, LLC., contacted OSHA’s On-Site Consultation Program for help identifying workplace hazards at the Monroe, La., facility where it manufactures storage tanks and pressure vessels for the petrochemical, paper, and energy industries. After an initial consultation, the company corrected all identified hazards, and continued to work with consultants to develop a workplace safety and health program. Over the course of four years, JMW’s rate of recordable injuries dropped by nearly 80 percent – seven times lower than the average injury rate for this high-hazard industry. Because of these efforts, JMS has been designated a Safety and Health Achievement Recognition Program participant. For more information, read the company’s success story. OSHA and Holder Construction Company, Inc., entered into strategic partnerships to protect workers during the construction of an office building and a parking garage in Ft. Worth, Texas. The goals of the partnerships are to eliminate serious workplace hazards, prevent work-related injuries and fatalities, and develop an effective safety and health program. For more information, read the agreements. The Colorado Health Care Association (CHCA) renewed a four-year agreement with OSHA’s Denver and Englewood offices to create safer workplaces for employees in long-term care nursing facilities. The alliance focuses on musculoskeletal disorders related to patient and resident handling; bloodborne pathogens; tuberculosis; slips, trips and falls; and workplace violence hazards. CHCA and OSHA will work together to provide training and education on the industry’s most prominent hazards, and share information on best practices in hazard prevention. OSHA and OSHA Education Centers in Louisiana, Oklahoma, and Texas, are offering a free WebEx presentation on silica hazards from March 5 to 9. 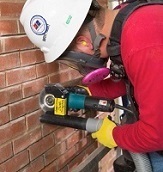 The one-hour webinar will focus on compliance with the OSHA standard for silica in the construction and general industries, and best practices for prevention. Register here. As cases of flu remain high across the country, proper precautions must be taken to keep workers healthy. 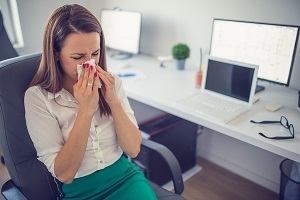 OSHA’s Seasonal Flu webpage provides basic precautions that should be used by employers and workers in all workplaces, such as frequent hand washing, and covering coughs and sneezes. OSHA also recommends that health care professionals follow infection control practices; use gloves, gowns, and other protective equipment to reduce exposures; and encourage sick workers to stay home. OSHA is ending its Resource Center Video Loan Program on Feb. 15, 2018. 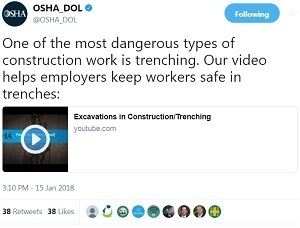 Videos on workplace safety and health are now available on OSHA’s Videos webpage. QuickTakes is emailed free twice monthly to more than 200,000 subscribers. You can receive it faster and easier by subscribing to the RSS feed that delivers almost instant information. Visit OSHA's RSS Feeds webpage to subscribe.